Could it be the rumored Bolt-based crossover? General Motors has announced a new electric Chevrolet car will be entering production at its Orion Township plant in Michigan. GM is investing a whopping $300 million into the facility to produce the new electric model, which will bring 400 new jobs to the Orion plant. Details about the new electric Chevrolet are scarce, but GM says it will be an "addition to the existing Chevrolet Bolt EV” and will be designed and engineered off an "advanced version” of the Bolt EV’s architecture. There are no clues which body style the new EV will take, but it’s widely expected to be a compact crossover. GM is also plotting an electric Cadillac three-row crossover, which was previewed earlier this year. The new electric Chevrolet model was originally going to be produced outside of the US, but GM decided to build it in Michigan since the Bolt EV is produced at this plant, so it makes sense for both models to share the same assembly line. 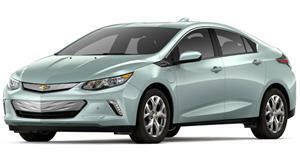 GM says more details about the new mystery electric model will be revealed closer to production.